Allergic to Fido? Good news – you don’t have to give him up! 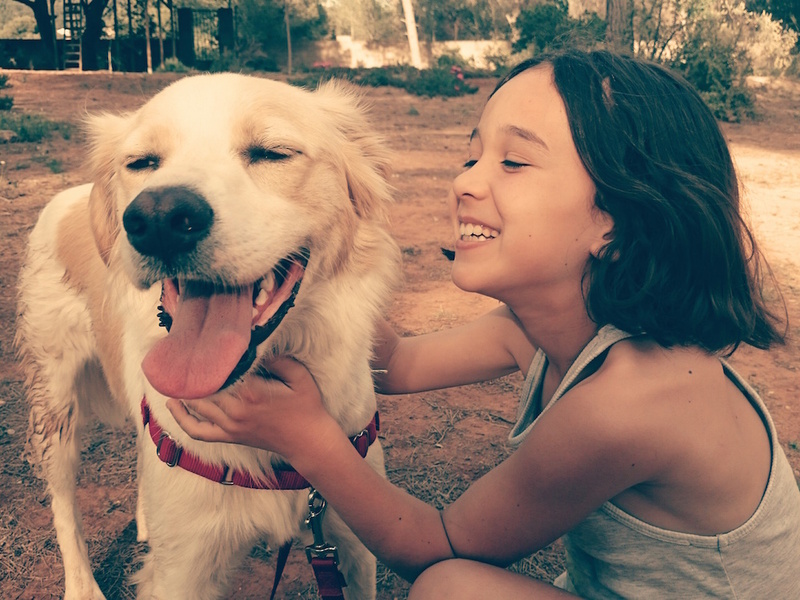 Living with a pet or interacting with animals can create misery for individuals with allergies and asthma. Pets and animals like cats, dogs, ferrets, and even horses, cows, goats can fill our families’ lives with happiness and comfort. If you suffer around your pet with itchy eyes, tearing, sneezing, runny nose, chest congestion, coughing and wheezing, don’t jump right to giving up your pet – instead, seek help from an allergist to learn your options for managing pet allergies. To start, undergo skin testing to know what exactly you’re allergic to, and then take steps to make things better. So many individuals come to our office and feel that their symptoms are caused by allergies, but in reality it is not even an allergic problem! What are pet allergies, exactly? Let’s try to differentiate between a pet allergy and other causes of discomfort. In short, an allergy is itching. You are itchy because your body – white blood cells, particularly eosinophils, mast cells, and basophils – are releasing histamine. The more allergic you are, the more histamine will be released. That is why we take antihistamines to try to control the symptoms from too much histamine. Histamine will cause blood vessels to dilate, which leads to congestion, will allow sneezing and runny nose, a tickle in the throat and can trigger the bronchioles to constrict, and that creates the symptoms of asthma. If you feel these symptoms when around your pet or horse, then you may be allergic to your beloved animal. We used to think that animal hair was the problem, but it’s actually the skin, dander, saliva, and urine of the animal creating symptoms in susceptible individuals. You may feel more uncomfortable with some animals but not others, and that may be the because of the quantity of allergens released by that individual animal. So your own cat may not bother you as much as your friend’s cat. 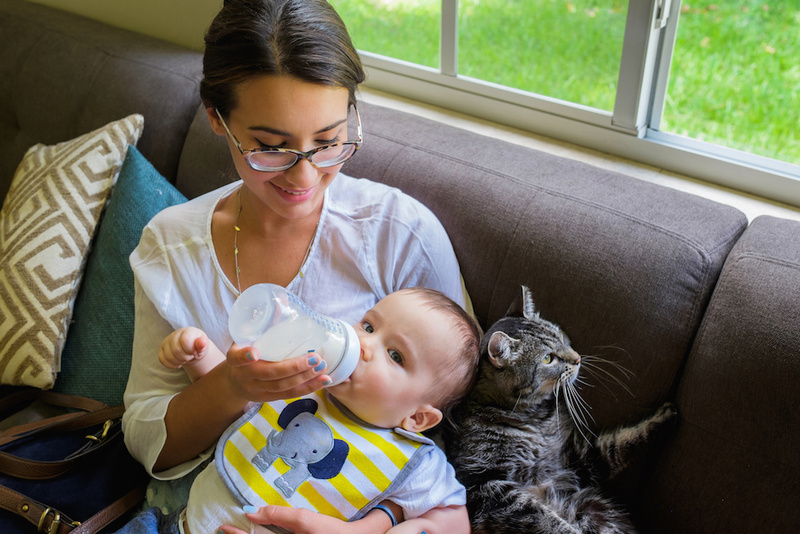 There is actually good information showing that you can become desensitized — meaning the immune system is down regulated — allowing you to tolerate more exposure to your feline. Tip #1 – Manage pet allergens in the home. Keep your pet or your companion animal! Believe it or not, you may develop a natural tolerance to the allergens it produces, and your symptoms will minimize over time. You can minimize exposure by keeping the dog or cat in a separate area of the home and keeping that area clean by washing dog and cat beds every week, and vacuuming a few times per week. Remember that vacuuming will initially launch the allergen into the air for approximately two hours, so use a HEPA filter on your vacuum cleaner or have a non-allergic family member vacuum the area. Ultimately, all vacuum cleaners are helpful. The problem, however, is that all vacuum cleaners have to vent out the air that they are sucking in and if they throw out particles in the air, that creates more dust. You want to trap all the dust and allergens in the vacuum cleaner. A stand-alone air purifier can be a benefit, but unfortunately they are limited by their size. Small rooms will benefit from purifiers more than large rooms — you may not even notice a difference in air quality in larger rooms. We know it may be difficult to not sleep with your pets, but keeping your bedroom door closed can provide a big benefit. If you do insist on letting your pets in the bed overnight, using mattress and pillow covers, and washing the sheets in hot water every week to two weeks will be a big help. Tip #2 – Reduce pet dander. Pet dander is not dandy! Whatever you can do to reduce the shedding of skin cells, also called dander, is key. I caution against defaulting to frequent shampooing and brushing the animal constantly, because irritating your dog or cat’s skin can actually to more shedding, worsening your allergies. Too much washing, brushing or vacuuming the skin may cause bigger problems. Unfortunately, large animals can create bigger issues for people who are allergic to them. Their size, upkeep and the handling associated with these animals can complicate things. Ventilate well when grooming pets. Dust and wind will often cause nasal drainage, nasal and sinus congestion — which is not the same as an allergy. Remember, allergies mean a histamine release which causes itching. Walking into a barn will naturally cause nose problems in many people, and those issues are called non-allergic reactions. Irritation does mimic allergy symptoms, but because there is no itch, it’s not considered to be an allergy. Treatment consists of reducing dust exposure, ventilating the area as much as possible, brushing animals outside — but not so often that you create a worsened skin situation — and using petroleum jelly in your nose to help moisturize the nasal lining. Your nose will not feel dry and produce more mucus. If you have a healthy blood pressure, consider using decongestants like Sudafed. If you have blood pressure problems, take chlorpheniramine with phenylephrine. Use nasal sprays such as Afrin or Fluticasone if you experience irritation, because those can calm the irritation down. 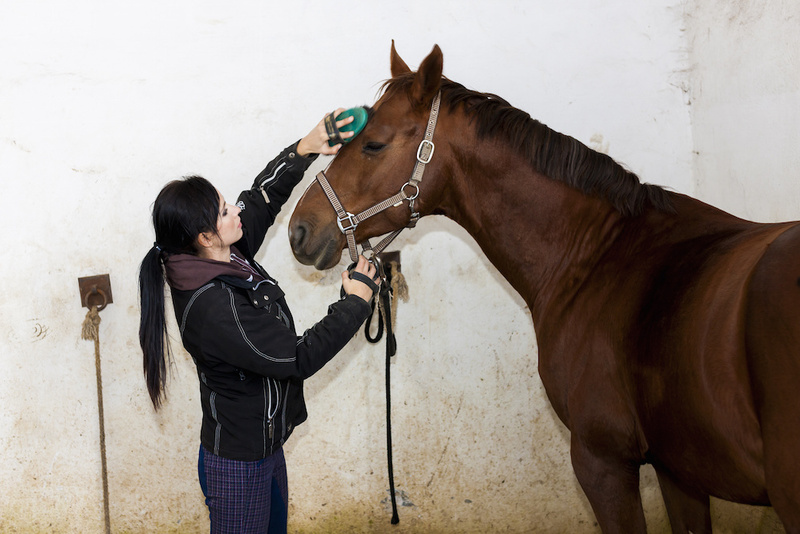 In some cases, wearing a mask along with protective clothing like long sleeves, gloves and sunglasses while working in a barn with large animals can help immensely. Tip #3 – Explore pet allergy treatment options. Antihistamines like Loratadine, Fexofenadine, Ceterizine are available over the counter. Nasal steroid sprays are also available, and adding allergy eye drops can help. These medications can be taken daily or just when there is exposure to your pet. If medications and avoidance are not working, you may need something a little more permanent. Allergy injections, also called immunotherapy, alleviate the symptoms of many people who receive them. Immunotherapy involves injecting the patient with the actual allergen, you may receive ragweed, grass pollen, cat or horse. This is called desensitization, and will allow you to leave the windows open, play outside and be close to your pet without any allergy or asthma problems. With immunotherapy, you can safely play with your pet and not worry about sneezing or wheezing. We know you love your pets and would do anything for them including suffering through nasty allergies. Follow the advice in this article and you may be able to live with your favorite pet and still maintain your comfort and sanity! Still suffering from pet allergies? Not to worry! Contact our practice today at 913-451-8555 to schedule an appointment for allergy help in the Kansas City area.